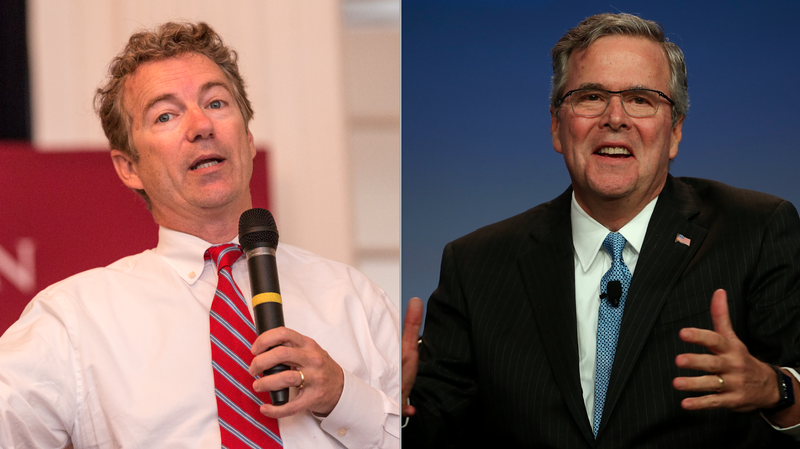 Sen. Rand Paul, R-Kentucky, accused Jeb Bush of "hypocrisy" Friday after a report in the Boston Globe chronicled Bush's marijuana use during high school. Bush, a former Florida governor and potential 2016 presidential candidate, opposes the use of marijuana for medical or recreational purposes. "This is a guy who now admits he smoked marijuana but he wants to put people in jail who do," Paul, who's also mulling a presidential bid, said during an interview with The Hill newspaper. "You would think he'd have a little more understanding, then." Paul continued, "I think in politics the biggest thing, the thing that voters from any part of the spectrum hate worse than anything is hypocrisy. And hypocrisy is, 'Hey I did it and it's okay for me because I was rich and at an elite school but if you're poor and black or brown and live in a poor section of one of our big cities, we're going to put you in jail and throw away the key.'" Paul has championed efforts to reform drug sentencing laws, saying it's "ridiculous" to incarcerate someone for years for possession of marijuana. He remains opposed to legalizing marijuana for recreational use, though he's spoken in favor of the rights of individual states to legalize medical marijuana. Last year, Paul and Sen. Cory Booker, D-New Jersey, introduced an amendment to prevent federal authorities from taking action against states that have legalized the drug for medical use.